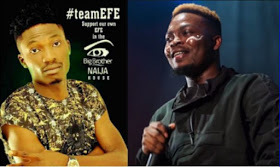 Few hours before Efe was declared winner of the Big Brother Naija 2017 reality show, Olamide made a pledge to support him when he gets out of the show. Olamide promised to work with Efe on a new single titled “Based On Logistic. 0 Response to "Olamide To Drop New Song Titled “Based On Logistics Featuring Efe"